Volunteer Today! Volunteer Registration Is Now Open! The N.I.T.E. Ride will be on Saturday, June 22nd for 2019. Head over to City Market for the N.I.T.E. 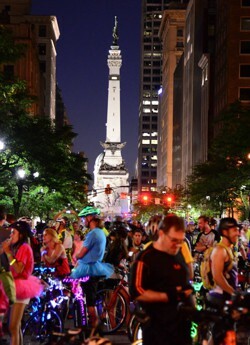 Ride, a leisurely 20-mile tour of Indianapolis at NITE! Experience what it's like to ride with 3,000 other cyclists under the stars over Indianapolis with a route that takes you on a tour of downtown Indianapolis, The Indianapolis Children's Museum, Butler University, Hinkle Fieldhouse, The Indianapolis Museum of Art, IUPUI and Monument Circle. Enjoy Downtown, Broad Ripple, the Indy Greenways and the Cultural Trail. Visit museums, watch an IMAX movie, stroll the Indianapolis Zoo and White River Gardens. Take in an Indy Eleven soccer game. Shop Circle Center Mall. Tour historic neighborhoods on a bike. Ride the Saturday morning CIBA ride. To see a list of downtown activities and discount codes, see the Activities page. The N.I.T.E. Ride starts at 11:00 pm (at NIGHT!) from City Market and takes you on a tour of downtown Indianapolis, The Indianapolis Children's Museum, Butler University, Hinkle Fieldhouse, The Indianapolis Museum of Art, IUPUI and Monument Circle. Total route length is between 17 and 20 miles. Check out this list for preparing to ride the N.I.T.E. Ride. NITE Ride "LITE Up Your Bike" Contest, sponsored by Bicycle Garage Indy. LITE Up Your Bike and win! Rent a bike from Bicycle Garage Indy Downtown. The NITE Ride starts just outside of BGI's downtown store at the City Market 242 E Market St. (inside YMCA at City Market). NITE Ride Bike Rental fee is $40/bike. Please note that registration for the NITE RIDE itself is not included. Hybrid Men's: Giant Escape 2 is a comfortable but quick, lightweight bike that is perfect for urban rides. Hybrid Women's: Liv Alight 2 is a comfortable but quick, lightweight bike that is perfect for urban rides. Cruiser: Townie 7D is very comfortable but not as quick as the other rental bike choices for the NITE RIDE. All of our rental bikes are fully checked out by our professional service staff before every rental. Bikes come with locks and ample bike parking is available in the area. Please call BGI's downtown store with questions: 317-612-3099. Reserve your bike NOW - Limited supply of rental bicycles are available. Reserve your bike here: Not Available Yet. Prevent bicycle breakdown on the NITE Ride route by having your bike checked for service/repairs prior to the day of ride at your local bike store. If on the day of the NITE Ride you need assistance, please bring your bike to Bicycle Garage Indy's tent for service and repair. BGI will have supplies available for purchase and can assist with minor repairs before and along the ride. Save yourself the frustration of suffering a break down the day of by having your bike checked out beforehand.